By taking such a large payment now, the Dunnes Stores family eliminates future currency risk if sterling, as expected, falls further against the euro as the effects of Brexit sink in. Ardagh Group has announced that it is creating limited edition ‘Star Wars: The Last Jedi’ aluminium Coca-Cola Zero Sugar bottles, in collaboration with Coca-Cola. A group of workers at Pepsico’s Irish operation, have been encouraged to accept a pay rise offer of almost a tenth of their current salaries. The European Consumer Centre Ireland (ECC) has today released a statement today (11 December) to warn online Christmas shoppers to take time to ask about returns policy when buying last minute Christmas gifts. Global sales of Baileys and other Irish cream liqueur look set to break the 100 million bottle barrier for the first time this year as they rebound after a “lost decade”. A new report from the Economic and Social Research Institute says the economy will have another year of strong growth this year and next. Aoife Clarke has been appointed chair of the Irish Spirits Association (ISA), where she will become the first female chair in its 20-year history. Pharmacy, cosmetics, electronics, technology and fashion have been the most popular categories for online shoppers here so far, this festive season. 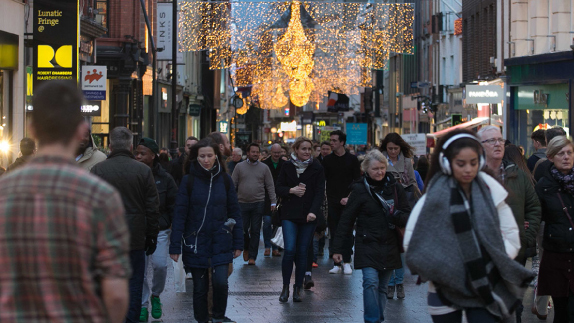 High streets and shopping centres across Northern Ireland are continuing to take a battering with footfall dropping by 2.4% in the last month.